Look no further. You’ve found the perfect game day snack. Our Deluxe Nacho Platter appetizer recipe piles on enough flavor to keep you cheering for the home team until the final buzzer sounds. 1 Melt Spread in 2-qt. saucepan over medium-high heat and cook onion, stirring occasionally, until tender, about 3 minutes. 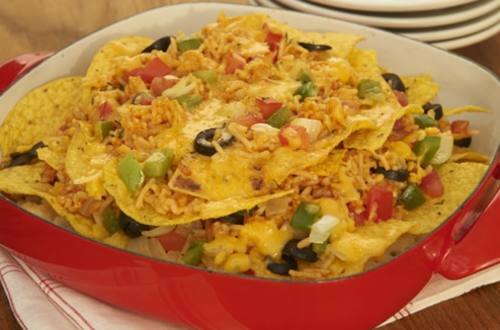 Stir in water, Knorr® Fiesta Sides™ - Spanish Rice and cumin and bring to a boil over high heat. 2 Reduce heat to low and simmer, stirring occasionally, until rice is tender, about 10 minutes. Stir in chilies; let cool slightly. 3 Layer 1/2 of the chips, rice mixture, tomato, olives and cheese in large, shallow broiler-proof or microwave-safe dish; repeat layering, ending with cheese. 4 Broil, or microwave, 1 minute or until cheese is melted. Garnish, if desired, with sliced chili peppers, sliced avocado, sour cream, chopped fresh cilantro and additional shredded cheese.